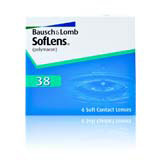 If you suffer from myopia or hyperopia, the Soflens 38 contact lenses by Bausch and Lomb is an excellent lens for helping correct your vision impairment. These contacts are designed for people in the age range from twenty to forty. The Soflens 38 contacts use technology created for deposit resistance to keep the contact clean for the entire day of wear. The high-performance technology incorporated by Bausch and Lomb should put anyone at rest for choosing the right contact lens for vision correction. What is especially great about these lenses is that they can either be worn daily or on a weekly basis. This means that if the contact is bothering you during wear you can adjust your wear times to satisfy your eyes. The lenses are also tinted for the ease of finding in solution. This is an excellent, general-purpose weekly lens to choose from and built with the highest level of quality.